Before we get into making a virtual reality headset, we should know something about, what exactly is it? “VIRTUAL REALITY” what’s that? Well.. it’s an immersive multimedia, precisely when we here to some music through headsets we actually cover our ears and listen nothing but music which is playing in that headsets, similarly when we put on vr we see multimedia everywhere we feel like we are in another world where it seems like things are happening really in front like 3d. There are two ways to get a VR headset, 1) Buy it online and assembly; 2) Make the parts yourself with measurements specified by google on the internet. Before we get started, let me tell you that the cost in both cases is similar and trust me this is as good as OCULUS RIFT. A real experience. -> If you can’t wait or don’t want to miss anything on your VR. Buy it online. I know we are not interested in reading long long paragraphs of steps, so check out the video below. 1. Download this compressed template folder from Google. You will see two design files. 2. Print one of the design files. You can print the first design file using a standard printer (and later use the design as a template to manually cut Google Cardboard from cardboard), or you can print the second design file using a laser cutter. It will print (aka cut) cardboard stock into the exact shape you need. Keep in mind that laser cutters and cardboard stock are often pricey, so it will be much easier on your wallet to go the standard printer route. The first thing you’ll need to do is to glue the template onto cardboard. Any craft or multi-purpose glue will work. Google also said you could use an extra large pizza box or buy cheap cardboard sheets from Gaylord or Kraft, available for purchase at Amazon and most art supply stores. E-flute corrugated cardboard is preferred because it’s thin. Minimum size: 8.75in (22cm) by 22in (56cm), and 0.06in (1.5mm) thickness. The second thing you’ll need to do is to glue the light numbers (as seen on the template) onto the dark numbers. It’s like you’re doing beginner-level origami. Once that’s done, follow the template lines and cut your Google Cardboard from the cardboard sheets. An X-Acto knife, box cutter, or any pair of scissors will work. There’s no need to buy specialised craft scissors just for this project. You can also use a ruler to ensure straight cuts. 4. 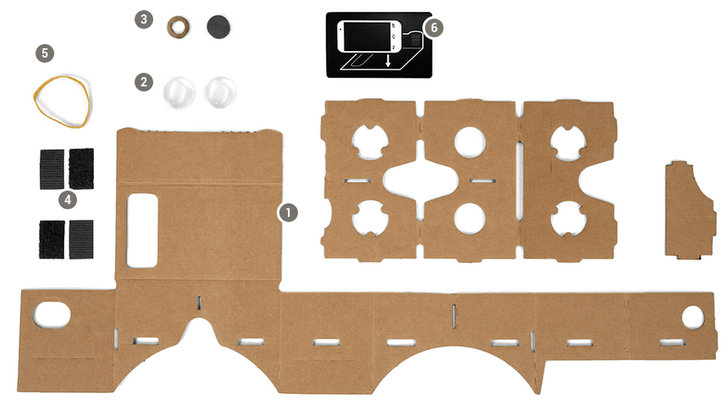 Now that you have your cardboard cutout, you are free to assemble Google Cardboard. 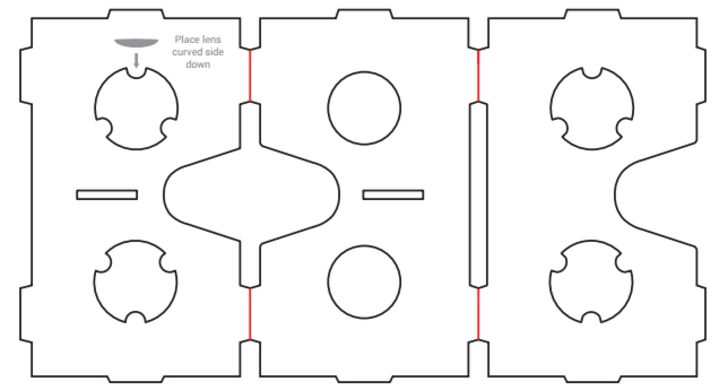 Follow the red lines on your template to fold the cardboard cutout. 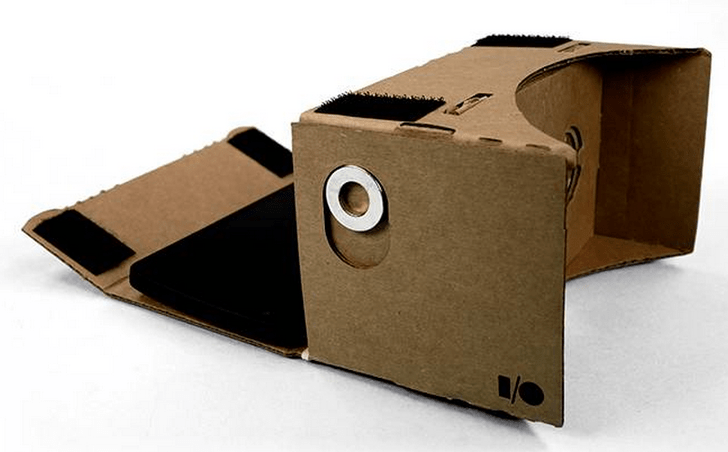 Like magic, you will see the form of Google Cardboard emerge. But you’re not done the assembly process yet. You need to acquire some tools and materials. 5. This next part is the trickiest: you must get two lenses that have a 40mm focal distance. Google recommended Biconvex lenses because they prevent distortion around the edges. You can also use the lenses that come with the Durovis OpenDive Lens Kit. You can find these online. 6. You’re not done buying things just yet. Find and purchase one neodymium ring magnet and one ceramic disk magnet . Approximate size for both magnets: 0.75in (19mm) diameter and 0.12in (3mm) thickness. Once you’re all set, affix the ring magnet and disc magnet exactly where the template shows on your Google Cardboard. 7. You’re half-way done the assembly process. Now you need to buy two strips of regular strength adhesive-backed velcro. Again, they’re available online. Next Post BEST APPS AND GAMES FOR YOUR CARDBOARD V.R.